Today on Rebel Boss Ladies episode 012, we’re going to talk about the one thing that everyone gets nervous about – taxes. Taxes may seem overwhelming – income tax, deductions, sales tax – how much do you really need to know about taxes as an online business owner? 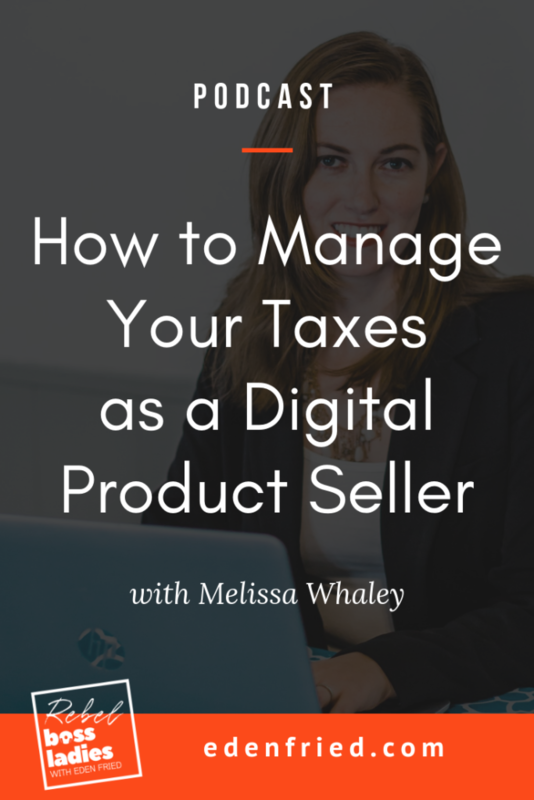 Our guest today is going to walk us through everything you need to know about taxes when you sell digital products online. Melissa Whaley has been nerding out over taxes for over 10 years. She’s a virtual tax advisor for online and creative businesses and is going to share her experiences working with online business owners and digital product sellers. Get ready, because she’s about to share everything you need to know about finances when you sell digital products online. This experience taught Melissa a lot about taxes for business owners and inspired her to try to help others with this tricky topic. Today Melissa shares with us a ton of really helpful tips about how to navigate your income taxes, how to plan for sales tax by state, and what to do if you ever get a letter from the IRS. This is important for everyone, especially for new business owners who may be experimenting and aren’t sure if they want to invest in their business yet. Melissa recommends at the very least, having a separate PayPal account for your business expenses. “Most of the services that we’re going to be using to sell our products allow your people to pay through PayPal.” If you’re not ready to open up a separate business bank account, having a separate PayPal can be a great way to help keep track of your finances. When your business is more established, Melissa suggests opening a separate bank account to keep business and personal expenses separate. This is especially important when you’re trying to do your taxes and may not have a lot of time to go through your finances. Separating business and personal accounts can also help you get more deductions in the long run, Melissa says. Being aware of your business expenses can help you to make sure you claim all of your deductions at tax time, and save more money. The most important reason to establish separate accounts is because having a business account allows you to do some of the most foundational parts of establishing a business, like setting up a business name, registering a DBA and getting a tax ID on the IRS website. “Having this separate tax ID that again gives you a little bit of separation between your business and your personal life allows you to open up official business accounts or business credit cards,” says Melissa. She emphasizes that this ID also helps with your tax documents, like 1099s, and can also help you protect your Social Security number. 2. Find an app that helps with your finances. There are a ton of apps out there for people who may need help keeping track of their finances, but Melissa recommends QuickBooks Self-Employed, which can be used on your phone or computer. If your business is new and you’re not sure about opening a separate bank account, QuickBooks Self-Employed is super helpful for people who mix their personal and business expenses. After linking your financial accounts, “you go through your bank transactions, your credit card transactions, your PayPal stuff and mark it as business or personal.” At the end of the year, the program does all the organizing for you and spits out the reports you need to do your taxes. Perhaps the most important feature of the program is that when you fill out a profile, it helps calculate how much you should be paying throughout the year in quarterly taxes. 3. Know WHEN to pay and be aware of the quarterly tax system. If you’re new to starting an online business, you may not be aware of the differences in paying taxes when you’re self-employed versus working for someone else. When you’re employed by someone else on a “W-2 job,” your employer withholds taxes out of your paychecks and sends it to the government on your behalf. Taxes for self-employed business owners are a little different. “When you get into self-employed, you’re now both the employer and the employee. So it’s your job to make sure you’re sending in your taxes throughout the year instead of just waiting until tax time and then getting this big bill and having to pay it off,” explains Melissa. Quarterly taxes allow you to prepay your tax bill throughout the year. Making sure you know when, and roughly how much to pay can make tax season a lot less stressful. It also helps you avoid fees or fines for late taxes. “The goal of estimated quarterly taxes is that when you go to file your tax return sometime between February and April the next year, you owe the IRS less than $1000.” Melissa elaborates that it’s okay to be a little over or under, but owing more than $1000 means that the IRS will impose underpayment penalties or late fees. 4. Make sure to include all of your deductions when calculating income tax. Deductions can be especially important for new business owners, because these expenses can help offset income taxes even if you’re not making a lot of money. You may not realize it, but apps and accounts on your phone can count as deductions, says Melissa. It’s easy to forget to claim these, especially if you’re paying for them through your personal account. If you’re paying for a social media scheduling app, a productivity app, or even a meditation app, you could possibly include this in your deductions. Another expense to be aware of are the small business purchases you may make while doing personal shopping. Melissa says, “You know when you make the run to the store and you’re getting shampoo and toilet paper and crackers and then you go past the office supply aisle?” All of those little office purchases, like planners, office supplies or decoration, can be deducted. Make sure you’re keeping track of these small expenses because they can really add up. Other important deductions are things like conferences, online courses or memberships. “These are totally deductible” says Melissa, and are expenses that you definitely don’t want to miss out on reporting. 5. Do some research, and don’t be surprised about how much you owe in income tax. Putting aside money to pay taxes and being aware of roughly how much you will have to pay are two important ways to make sure you’re ready during tax season. Digital product sellers online have to pay two different kinds of taxes: income tax and self-employment tax. Income tax varies from person to person because of the different tax brackets and the total income of your household. State income taxes will vary from state to state. Melissa recommends setting aside 15% to cover that self-employment tax, and tacking on another 10-20% to cover your income tax. Make sure you take into account the total household income and how your spouse’s salary may affect your tax bracket and the percentage you will have to pay. Melissa also suggests that if you live in a state with a high income tax, like California, New York or New Jersey, you should add an extra 5%. In some situations, you may not actually owe anything on your taxes. If you have kids you’ll get child tax credits, or if you’re in college you can receive education credits. 1. Know if you need to charge sales tax for your digital products based on the state you live in. Some states tax digital products and some don’t, so whether or not you need to charge sales tax on your digital product varies state by state. “Research your own state where you’re physically located first and make sure you know whether you need to be taxing digital products to sales within states,” advises Melissa. If you’re selling from a state that does tax digital products like Vermont, and you had customers buying from that state, you would have to charge sales tax on the product. An important thing to keep in mind is that even if you don’t charge your customers sales tax, but the state requires you to, you will still have to pay the tax out of pocket. 2. Be aware of the nexus of different states when selling digital products. Things get tricky when you’re selling digital products outside of your state. Once you reach a certain threshold, or “nexus,” in a state that requires sales tax, you will have to start paying sales tax for that state. “Basically if you sell over X number of dollar amount or X number of sales in certain states, then you have to start collecting sales tax,” Melissa explains. Most of the thresholds are quite high in various states, so unless you’re making over six figures in digital product sales, you probably won’t have to worry about reaching the nexus. If you want to learn more, however, you can head to taxjar.com, a website that Melissa recommends for anyone who needs some help calculating their out-of-state sales tax. 3. Check to see if the product selling platform you want to use has the capabilities to charge sales tax. Before you invest a lot into an online platform to sell your digital products, make sure that it has the ability to charge sales tax. While many of the big shopping cart platforms do, some of the smaller ones may not. What do you do if your platform doesn’t have the ability to charge sales tax? Make sure you do your homework before you choose a sales tool. If your state taxes digital products, pick a platform that allows for this before you invest and start putting a ton of products up on that platform. What if you live in a state that doesn’t require sales tax, and the tool you use doesn’t configure tax based on different states? Should you collect sales tax from everyone? Melissa says no. “It’s actually better to not tack on sales tax and eat the sales tax out of your profit for the specific places you need to collect it.” She also recommends that you should pick a platform that allows you to have this capability, if you think you may need to calculate a lot of out-of-state sales tax. What Should You do if You Have Problems with Your Taxes? She recommends that if you owe money to both your state and to the IRS, pay your state first. The IRS offers payment plans, and things can be negotiated. Melissa does suggest though that if you need to negotiate with the IRS, you shouldn’t do it alone, especially if you owe a large amount. Melissa recommends checking this site out for sales tax information for digital products!